I love the juxtaposition of this collage of tattoos, which some would easily dismiss as garish, next to a soft, feminine dress. 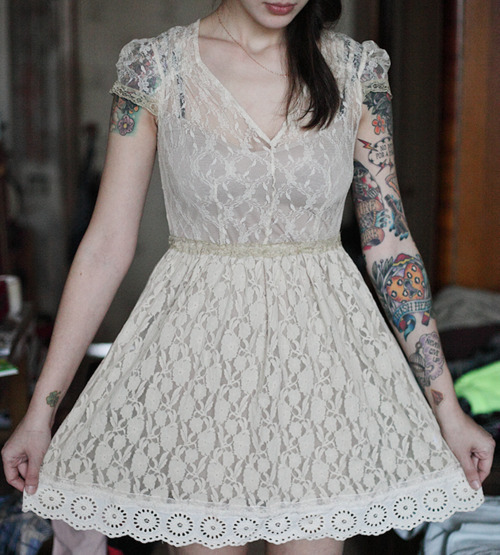 Just one more reminder that many women enamored with ink do not wish to abandon prettiness. I can't foresee myself acquiring a sleeve; in fact, I believe I'm done with anything on my arms (but I would hate to have to eat my words!). Still, my heart always skips a beat when I see a woman embracing a delicate femininity along with a cultivation of personal artwork. Time to let the baby out of the bag. Not your mom's open mic venue.